This January marks the thirtieth anniversary of perhaps one of music’s most singularly “timeless” of records: Bruce Springsteen’s ‘Nebraska.’ Recorded in his New Jersey bedroom on a four-track cassette deck (a Tascam Portastudio 144), ‘Nebraska’ is Springsteen’s sixth studio album, and follow-up to ‘The River’, Springsteen’s colossal double-album with the E Street Band released two years beforehand. Springsteen and the E Street Band had already solidly built their reputation to become rock ‘n’ roll’s “saviours” with a decade’s worth of multi-million-selling albums and endless tours. The collection of songs that would spawn ‘Nebraska’ were initially only intended as demos to show the E Street Band as a blue-print for a future album together. It had been widely thought Springsteen’s follow-up to ‘The River’ would be a live album, a set of songs that would cement Springsteen’s reputation as a twentieth century rock ‘n’ roll icon. Springsteen, however, had other plans. As it turned out, the very songs Springsteen recorded in his New Jersey bedroom would remain unchanged. Imperfect. Raw. Fragile. 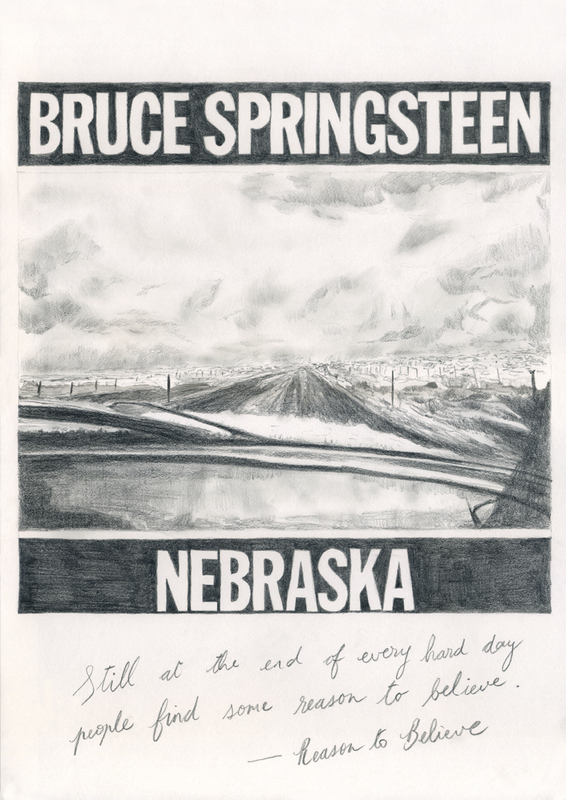 ‘Nebraska’ today still stands for all things any album (or any artwork) should hope to achieve: It’s an album made on Springsteen’s own terms – and no one else’s – at no point are the pressures of commerce or expectation going to get in Springsteen’s way of making his record. Nor does he ponder for an instant the expectations of his (by now substantially ‘huge’) audience which would presumably weigh heavily on anyone’s shoulders. As teenagers, myself and my twin brother Mark would earnestly build our collection (slowly but surely) via dozens of ‘to get’ lists (inspired mainly by our favorite bands’ own favorite records) on an ever-growing number of scraps of paper. One to rival our dad’s proud record collection even. It would be a long road. At least there were the two of us though. We’d see the list through to completion together. It was only a matter of time. That’s all that mattered. It was a simpler time too. No computers. No internet. No mp3’s. If you wanted to hear a song badly enough you’d sit for hours-on-end waiting at the radio for the song to come; press record on the tape cassette deck while keeping the ariel just-so with the other hand – between index finger and thumb. A delicate operation. It demanded great patience and keen anticipation. Not to worry if the recorded version contained as much radio static as song, as many radio waves as sound waves. It was all part of the magic. The collection could consist of tape cassettes, compact discs or records (a personal choice). Our only (unspoken) rule: If I had got an album by, say for instance, Johnny Cash, I would now have the rights to buy anything else by him. Mark could not. Likewise if he had discovered The Velvet Underground – while I could listen to them as often as I’d liked to – I could not buy any of their records. So, we divided up our musical-map-of-the-world as best (and as fairly) as we could. On one fine Summer’s day Mark picked up a Neil Young album. Bruce Springsteen, then, was mine (fair is fair). So, the day I picked up a second-hand copy of Bruce Springsteen’s ‘Greatest Hits’ it paved the way for us to embark on the Springsteen voyage together – with me as decision-maker. The Springsteen songs we would have been familiar with growing up were those ones on radio – principally the local lackluster radio station broadcasting to the Cork environs. Churning out whatever chart hits were in fashion at the time. The whistle-to jingles. The obvious. Drudgery, then. Now and then though – albeit rarely would come a song unlike the rest. Not only would you hear the music. You could ‘feel’ it. Bruce Springsteen’s ‘Hungry Heart’ was one such song. What struck me most was the voice. The delivery. Whoever was singing the song meant it. It sounded like his life depended on it. I was reeled in. A quick side-track. While slowly building a music collection to rival our dad’s record collection we would try our best to vary our choices as best as we thought how. For instance, if I picked up a Nick Drake album I would make doubly sure the next time around (a month’s time perhaps) to get a female singer-songwriter. So, we had been piecing together our Byrds’ collection. Again, starting from the ‘greatest hits’ and working our way around to the one’s that appealed to us the most from that set of songs. On our third Byrds album in (The Notorious Byrd Brothers, Younger Than Yesterday were first up) we decided (unanimously) to purchase 1969’s ‘Ballad Of Easy Rider.’ (Namely due to the presence of ‘Jesus Is Just Alright’ appearing in the centre of the tracklisting) What left most impact on me (as beautiful as the music was) was the sleeve notes written inside. No album I’ve ever encountered says “I’m lonely” quite like Bruce Springsteen’s ‘Nebraska.’ It’s an album to heal any sadness or darkness (however small). As is the case for most people, music means more than anything. Records are friends. Some can become lifelong friends – ever-reliable and ever-present. As is the case with me for ‘Nebraska’. Springsteen’s vocal delivery was inspired by his musical heroes Woody Guthrie and Bob Dylan – particularly Dylan’s early records. ‘Johnny 99’ – like opener ‘Nebraska’ – is a tale of destruction, this time a tale of a man who has just been let go from his auto plant job. The song itself – although only Bruce playing the same single chord and armed with a harmonica – has all the power and vitality of an E Street Band rock-out or the blues singers that influenced Springsteen. ‘Highway Patrolman’ perhaps best epitomizes the Nebraska album and Springsteen-as-songwriter. A fragile beautiful song about the bond that exists between family, in this case between two brothers Joe and Franky Roberts. The lyric ‘nothin’ feels better than blood on blood’ is my personal favorite lyric ever penned by Springsteen. The recording is again beautifully raw (a creaking chair would stay in the final cut of the song). The song reminds me of Willy Vlautin’s debut novel ‘The Motel Life’, which follows the doomed lives of down-on-their-luck brothers Frank and Jerry Lee Flannigan. ‘Highway Patrolman’ would inspire Sean Penn to make (write and direct) ‘The Indian Runner’ in 1991. The film focuses on the bond between both Frank and Joe Roberts, a visual version of the Springsteen song. ‘State Trooper’ is similar in style and delivery to ‘Johnny 99’, another song in the true spirit of the 1930’s blues songs. It recalls the spirit of Elvis Presley in vocal delivery while Springsteen’s sudden roar and howl drips with emotion – connecting to the helplessness of our central character who – in apparent desperation – is speeding on the road to nowhere leaving his former life behind him. ‘Used Cars’ is the touching tale of a father buying a sequence of used cars no longer wanted by their previous owners. A primitive and almost childlike keyboard can be heard which only heightens the nostalgic and tender mood of the song. ‘Open All Night’ shares a feel to earlier Springsteen material, sounds like a song that could have been cut from ‘The River’ sessions, recorded two years earlier. It doesn’t quite have the heartbreak quality found in the rest of the album’s songs. ‘My Father’s House’ is a deeply personal and moving song about a son who has lost touch with his father. A tale of regret; the song is as beautiful as any song penned by Springsteen. Bruce Springsteen, as both a songwriter and man, is a truly inspiring figure. What sums everything up is the man’s work ethic. His desire to make records. That simple desire to create music is as strong today as it’s ever been for Springsteen (and The E Street Band). He is a true artist: He don’t look back. As evidenced on last years ‘Wrecking Ball’, he’s recording music as compelling and as significant as ever. As if his life still depended on it, in fact. Springsteen’s position in my own music collection remains as it has done since I first picked up that second-hand copy of ‘The Greatest Hits’. Even as genres expand and space becomes an increasingly pressing issue, Bruce Springsteen’s albums take pride and place in the top shelf; aligned left and sorted by date; ‘Nebraska’ six from the bottom of the stack. A music collection without Springsteen. A music collection without ‘Nebraska.’ I find that hard to imagine. For doesn’t everybody need a friend to turn to? ‘Bruce’ by Peter Ames Carlin, a biography on Springsteen is out now. ‘Heart Of Darkness: Bruce Springsteen’s Nebraska’ by David Burke (Cherry Red Books) is out now.